Students collaborate in a biology lab. Photo by Carl Socolow '77. Over a million people in the U.S. suffer from cancer, and a cure has long been the holy grail of science research. 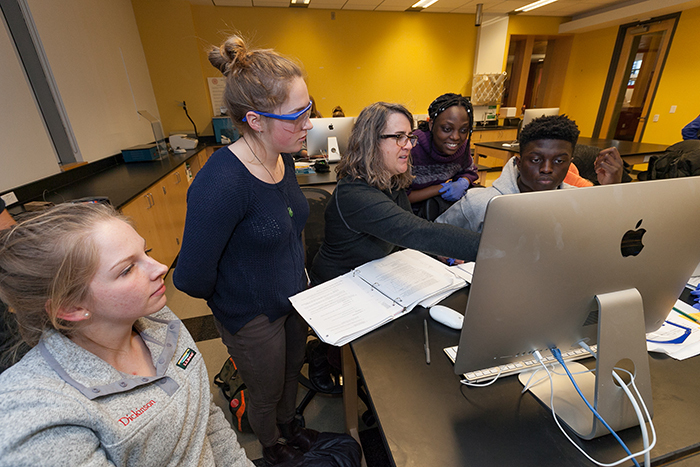 Increasingly, experts feel that interdisciplinary efforts give us the best chance of one day reaching that goal, and at Dickinson College an innovative research program is taking that approach while providing undergraduate students the rare opportunity to research uncharted territory. The student-faculty research initiative is led by Jeffrey Forrester, associate professor of mathematics, and Michael Roberts, associate professor of biology, and is now in its fifth year. Funded originally by a grant from the National Science Foundation and currently funded by a private foundation, the program opens doors to new opportunities for students by bridging complex math and science while elevating students from spectators to co-researchers. Each year, students who have completed the appropriate coursework are invited to participate in the program. The grant provides Dickinson the resources to host this group on campus over the summer for an eight-week period, during which they participate in full-time peer and independent research. They then continue this research into their senior years and often beyond. The group also attends the American Association of Cancer Research symposium—held this year in Chicago—where they meet and present their findings to over 20,000 cancer researchers from across the globe. By working on projects that are 'totally their own,' students' learning goes much deeper than it does in a typical undergraduate course. They become more than just biology, math or computer science majors; they become researchers, analysts and scientists, merging computational and scientific skills to understand the massive data sets generated by recoding gene expression in cells with more than 20,000 genes. Armed with this kind of experience, a number of the students in the program have gone on to M.D. and Ph.D. cancer biology programs at Johns Hopkins University, University of Pennsylvania and Penn State Medical School, to name a few.